Today, the U.S. Census Bureau released its annual update of State and Local Government Finances, providing national data for Fiscal Year 2010. The amount of state and local taxes paid in Massachusetts as a share of total personal income was 10.2 percent in FY 2010. 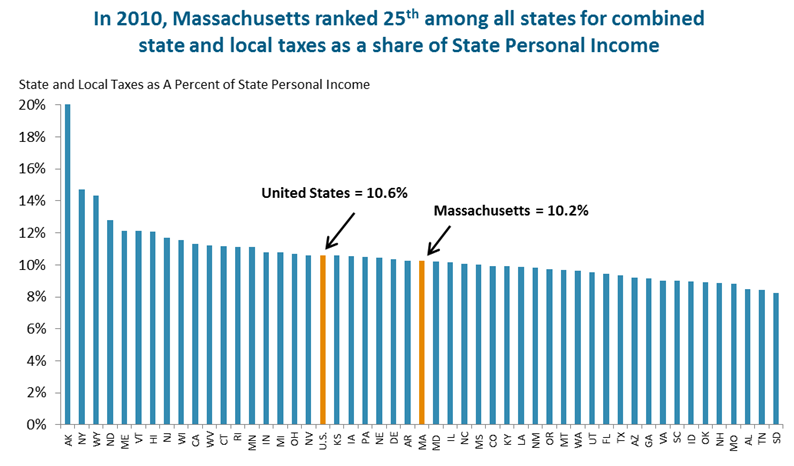 By this measure, Massachusetts had lower taxes than 24 other states (see Figure 1).1 Measuring taxes as a share of total personal income allows for a meaningful comparison among states (see "Technical Notes" at the end of this document). Taxes are the amount that we all pay towardsand the primary source of funding foreverything the people of a state choose to provide together through government, such as: public education; police and fire protection; roads, bridges and other infrastructure; environmental protection, parks, playgrounds, libraries; and a safety net to protect access to health care and other supports families depend onparticularly when they are faced with acute challenges. The Census data and the analysis we present in this fact sheet differ somewhat from that presented by a commonly cited source, the Tax Foundation. The Tax Foundation, like MassBudget, uses the basic structure of comparing taxes as a share of income. The Tax Foundation, however, makes a number of adjustments to the data. Two of these adjustments are particularly important. First, the Tax Foundation attempts to project current-year taxes as a percent of current-year income (which we don't do because we choose to report actual datawhich lags by several yearsrather than provide projections). Second, it seeks to estimate the taxes paid by residents of a state rather than taxes collected in the state. The second adjustment means that property taxes paid by a Massachusetts resident on a vacation home in Maine would count as Massachusetts taxes. While there are contexts in which such an adjustment may be helpful, for comparing tax policies of state and local government, it makes the most sense to look at the taxes collected by those governments. Finally, one important shortcoming in the state personal income data (compiled by the U.S. Bureau of Economic Analysis) that are used for calculations in this fact sheet is that these data omit income derived from capital gains. The tax data (compiled by the U.S. Census), by contrast, include all taxes, including the taxes paid on capital gains income. As a result, the measures presented in this fact sheet overstate the share of economic resources paid in taxes, making public services appear more costly to state residents than they in fact are. 1 The Census data can be found at: http://www.census.gov/govs/estimate/. Personal income data can be found at the Bureau of Economic Analysis (BEA) website: http://www.bea.gov/regional/sqpi/default.cfm?selTable=SQ1 . Alaska's very high ratio of state and local taxes to State Personal Income (20.8 percent) is the result of taxes collected from corporations on oil extracted from public lands. 2In fiscal year 2010, BEA state personal income in MA was $326.9 billion. If MA governments had collected a share of state personal income equal to the average share collected nationally (10.59 percent, a share 0.35 percentage points higher than in MA), state and local governments in MA would have had an additional $1.14 billion in combined tax revenue to work with in FY 2010 (0.0035 x $326.9 billion = $1.14 billion).